Weddings in Woods Hole. What a lovely idea! 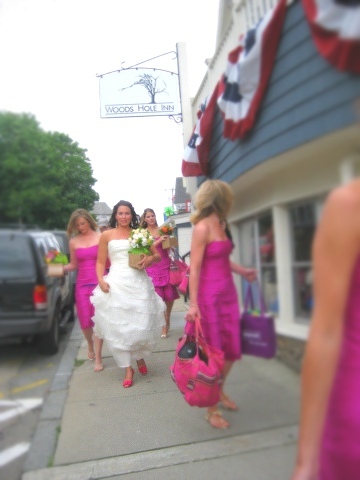 At the Woods Hole Inn, we embrace brides in the tradition of the past and the spirit of modern day design and service. We love customizing events for you, opening the whole property up for your inspired events and toasting you personally on your big day. This season, we welcomed countless honeymooners and bridal parties, some of whom took over the whole inn for their guests. One memorable event included a day-after-the-wedding brunch on our front porch for the bride, groom and 80 guests. It was hot, so we served a lot of lemonade and iced tea! Our restaurant Quicks Hole (open May – September) was happy to cater this lovely morning with homemade muffins, all natural jams, bite-size quiches and fresh fruits. Delish! We toast all the brides out there, and welcome you to come take a look at the Woods Hole Inn— the perfectly romantic part of your Cape Cod wedding or honeymoon.